Its a hard life being a bird but its especially hard if you’re a crane. 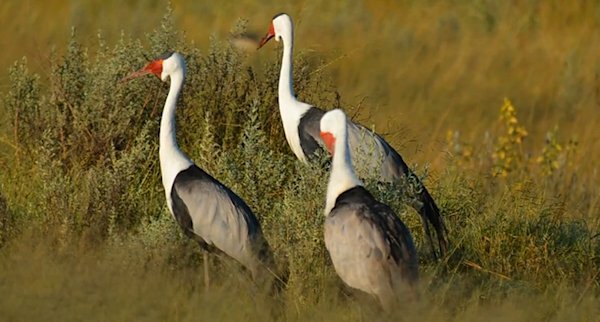 Of the fifteen species of cranes alive today eleven are considered vulnerable, endangered or critically endangered. The Wattled Crane unfortunately finds itself amongst the majority, with an estimated 7,000 birds remaining on the planet. Like many other species of cranes, the primary reason for its decline is the degradation, destruction and loss of wetland habitat. 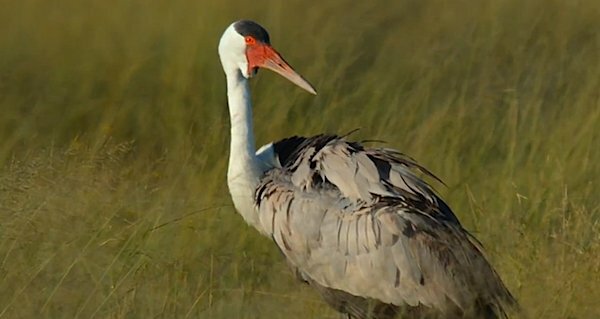 But there is one place in Africa where Wattled Cranes still gather in fair numbers – the Okavango Delta of Botswana. And we headed down to this part of the world in early 2012 to find out more about these threatened birds. Wattled Cranes are the only African cranes with all-white necks, rendering them unmistakable in the field. In addition they are the only crane species to possess pairs of unique wattles that dangle like ornamental ear-rings. In fact, these unique wattles are one of the reasons why these birds are placed in their own genus – the rather disturbingly-named genus of Bugeranus. Wattled Cranes are the second tallest flying birds in the world, after the Sarus Crane. They can reach heights of up to 5 ft 7 inches, taller than many adult humans. The birds are thinly distributed in eleven sub-Saharan African countries and an isolated population possibly still remains in the highlands of Ethiopia. But they are believed to have previously occurred over a much wider area, including coastal West Africa and much of the wetlands of South Africa. In fact, in South Africa they occurred in wetlands all the way to Cape Town at the southern tip of the continent. But Wattled Cranes are now extirpated from much of the country and are only reliably found in the highlands of KwaZulu-Natal and around the Wakkerstroom area of Mpumalanga. They are not bound to wetlands the entire year and large groups of birds will disperse to dry grassland and savanna outside of the breeding season. Besides the obvious reason for their scarcity (the disappearance of wetlands), there are other important factors that have contributed to the decline of Wattled Cranes. Firstly, the birds are highly territorial during the breeding season, defending an area greater than one square kilometer, which means that breeding densities will always be relatively low and, given the paucity of large wetland habitat, this does not bode well for their future. Secondly, Wattled Cranes have the lowest recorded recruitment rate (introduction of young birds to the adult population) of any wild crane species. This is due to the fact that only around 13% of paired birds successfully fledge a young bird. This is worrying because paired birds generally only lay one egg and the breeding cycle can be very irregular. In addition to this, the single ground-restricted young bird is at huge risk from the high diversity of predators that frequent Africa’s wetlands. So next time you grumble about the high unemployment rate, the price of gas and the general miseries of being human in today’s world, think about Wattled Cranes. 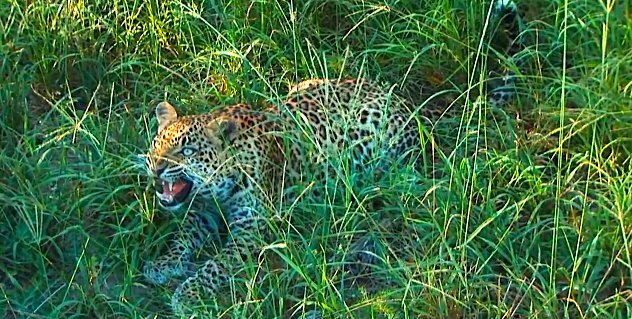 For more information on these stunning creatures and the beautiful country of Botswana, feel free to view our episode below. I was lucky enough to see some of these when I was in the Okavango, and was going to say they are the most attractive of Africa’s cranes, but then I remembered the Blue Crane and the crowned cranes. Africa really did well when it came to cranes. Absolutely beautiful shots. Could you tell me what kind of a tripod did you use for your scope and which camera is it hat you use with it? I have the edg vr 85 angled too and use a D90. But am impressed with your shots. Do let me know. @nisch I use a Nikon D5100 camera, EDG VR scope, FSA adapter and a Manfrotto 701 HDV head and 055CX3 body. Beautiful shots of the Wattled Cranes James! Sometimes it seems like natural habitat all over the world is diminishing at an ever faster rate. I’m glad to hear that Botswana has preserved so much of their natural habitat through conservation. Being so slow to reproduce, Cranes all over the world seem to be especially susceptible to dwindling numbers. @Larry Jordan Yep he sure was close! That’s what makes birding in Africa such a thrill. Glad to hear someone else appreciates the example that Botswana has set. Guy, please email me the shots and some text about your experience – location, number of birds, any other birds up there. And if the shots are good enough perhaps I’ll do a write up on this right here on 10,000 Birds as a follow-up to the Wattled Crane article. My email is james@birdingadventures.com. Thanks for reaching out! Hi Guy, saw your comment dd 17 July on Wattled Cranes. I work for Crown Foundation in KZN South Africa, and we are putting together a coffee table book on Cranes. So would be very keen to get more info from you.